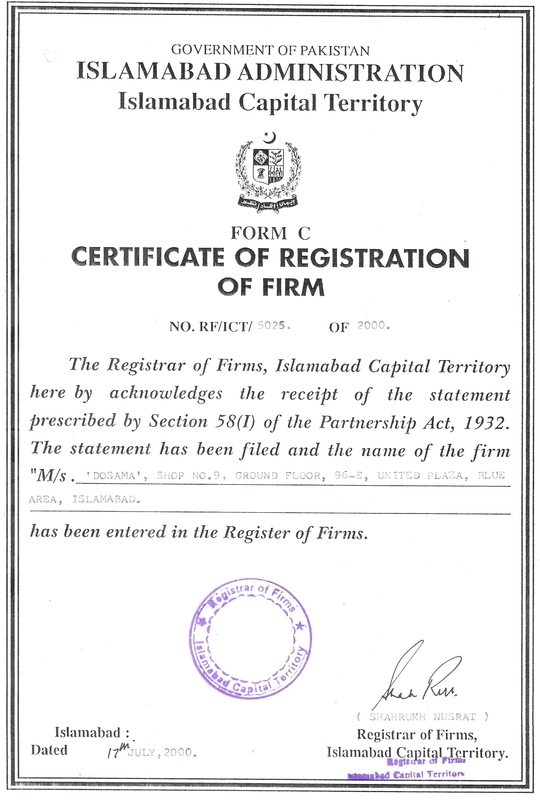 DOSAMA®, was formally registered with Company Registrar Office Islamabad in 17th July 2000, under partnership act 1932. 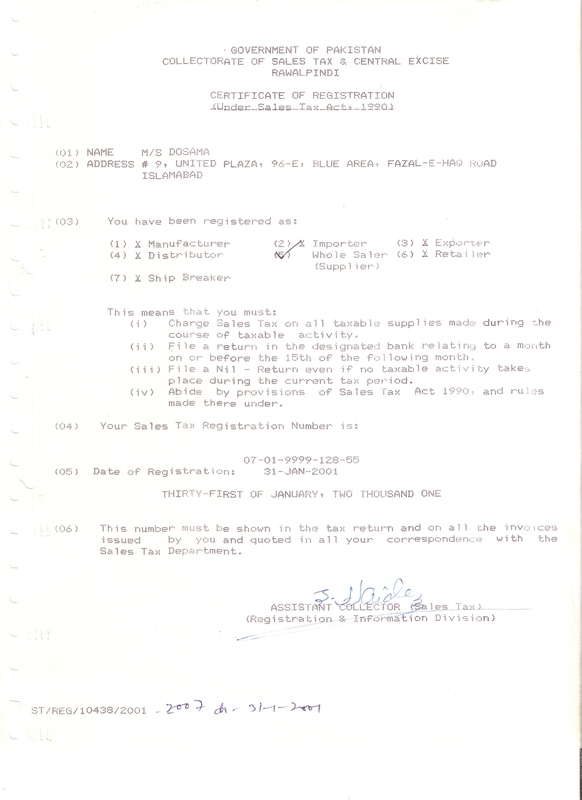 Registration No : RF/ICT/5025 of 2000. 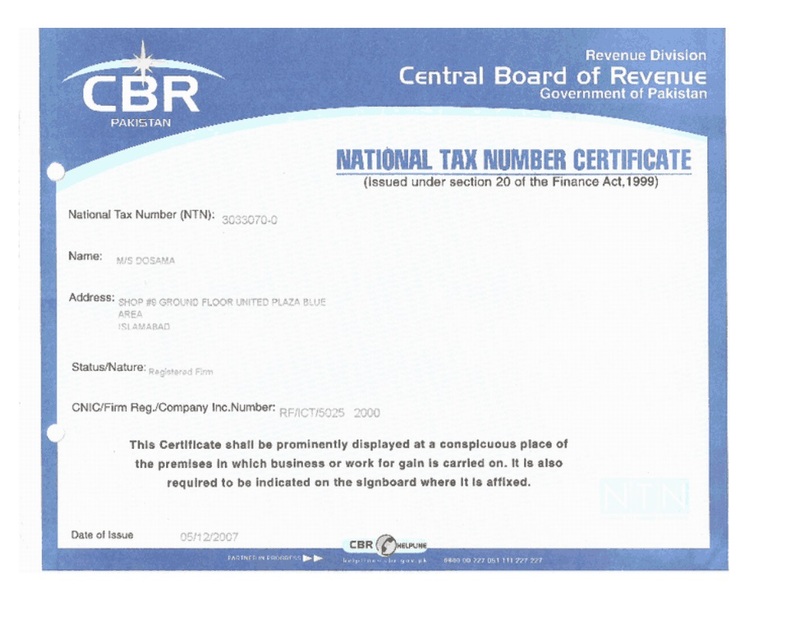 DOSAMA®, is registered with Excise & Taxation Department Islamabad for Professional Tax. DOSAMA®, is registered with Accountant General of Pakistan. Advertising, Publicity, Documentry related Equipment\Services\ Material. Architecting, Designing & Implementing Mega Projects. Calendestine / Securtiy digital Equipments. Communication & Digital Media Equipments. Consultancy & implementation of Total Security solution. Consltancy in construction/ Construction Material. Furniture Items (Domestic / Office). Medicine, Medical and Surgical Equipments. Provision Home / Office equipments. Repair & Maintenance against item mentioned above. Spares & Tyres being used in Vehicles (All Types). Stationary & Computer Stationary/Accessary/ Toner Cartridges & related Items. Supply of Reference Books, Text Books & Technical Education Books. DOSAMA® 1985 Office No:1C, Mezzanine Floor,Adeel Plaza, Blue Area A.K.Fazal-ul-Haq Road, Islamabad.